a) Find related keywords – This will return a list of the most popular related search terms for each keyword you enter. The keywords shown can be in the range of 100-1500+. You will be charged 90 units/keyword for choosing this option. b) Get Search Volume of the Specified Keywords – This will return the search volumes of all the keyword phrases you specify here. This is an indicative figure of how many people could be searching for that particular keyword. You will be charged 0.25 units/keyword for this. c) Retrieve the top ranking keywords for the specified URLs – This will return a list of up to 100 keywords that each URL is ranking for in the search engines. 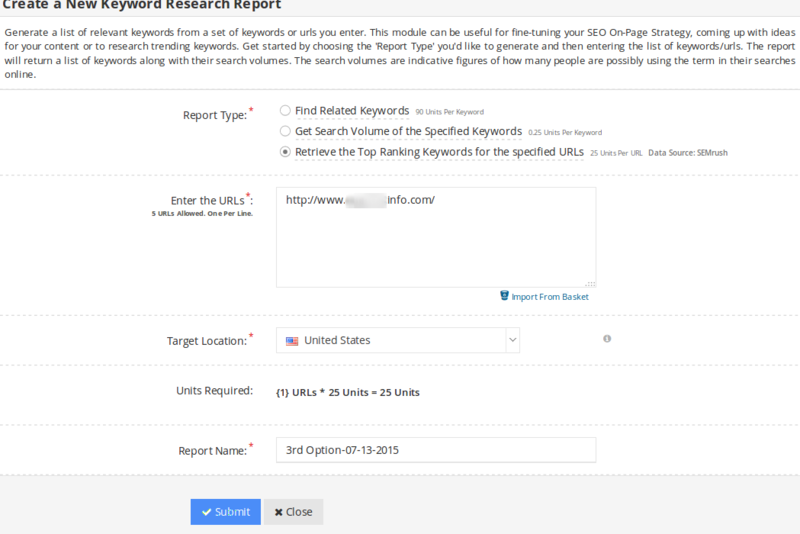 This way you can come to know the keywords for which your competitor’s are ranking. You will be charged 25 units/URL for this. 2) Enter the Keywords – You can enter up to 5 different keywords here. You also have the option to import keywords from the “Keyword Basket” provided you have added keywords there earlier. 3) Target Location – This will return results relevant to the country specified. If the target country is not present, we would recommend choosing the United States. 4) Language – This will return results relevant to the language specified. If your targeted language is not available, we would recommend selecting “All Languages”. 5) Additional Search – If you’re entering products or product categories such as mobile phones, laptops, iphone 6 etc as your keywords, please select this option to search for shopping terms typically used in association with the keywords entered. You will be charged 3 units/keyword for this. 6) Units required – This will display the total units required for this operation taking into account all the various options selected. 7) Report Name – This is the name by which your report will be saved. You can modify it as per your requirement or let it remain the same. After you have filled the form, click on the “Submit” button and wait for the report to get generated. This should take between 5-60 mins. You will see the status as ‘Processing’. Once the report is ready, you will see a notification next to your name on the top-right corner. The ‘Processing’ status will now change to ‘View Report’. 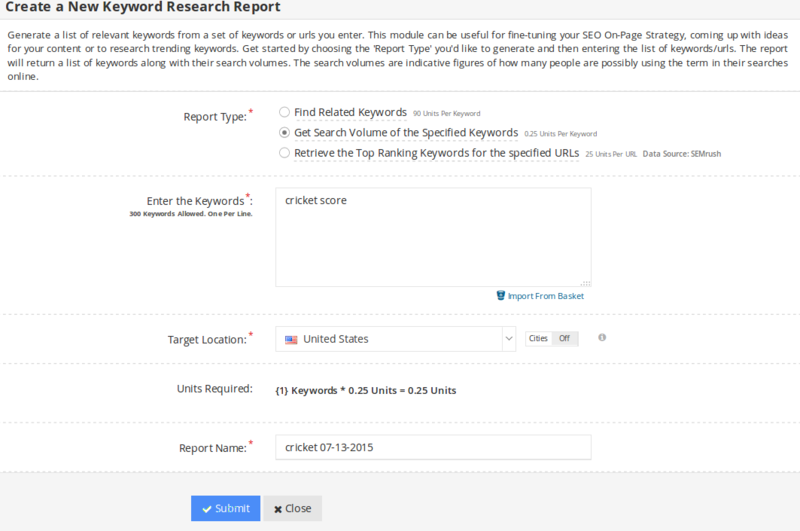 Clicking on ‘View Report‘ will open your Keyword Research report. You will see various sections in the report which are as discussed below. For now, we will talk about selecting the first option i.e ‘Find Related Keywords‘ discussed in step 2. 1) No. of Words – Total number of words present in the keyword. For e.g the number of words in the keyword ‘ashes cricket score’ is 3. 2) Volume (Google Search Volume Monthly) – An indicative number of people who search for this term on a monthly basis in the country that we selected. For eg – For the first term, there are less than 10 users searching for it. 3) Competition – Represented on a scale of 0 to 1, it shows the intensity of the competition in the advertising space. A higher number indicates more competition. 4) Cost per Click – This is the average price per click (in US$) you would have to pay if you had to advertise for this keyword in the search engines. 5) Impression Share – Impression share is the number of impressions you’ve received divided by the estimated number of impressions you were eligible to receive. 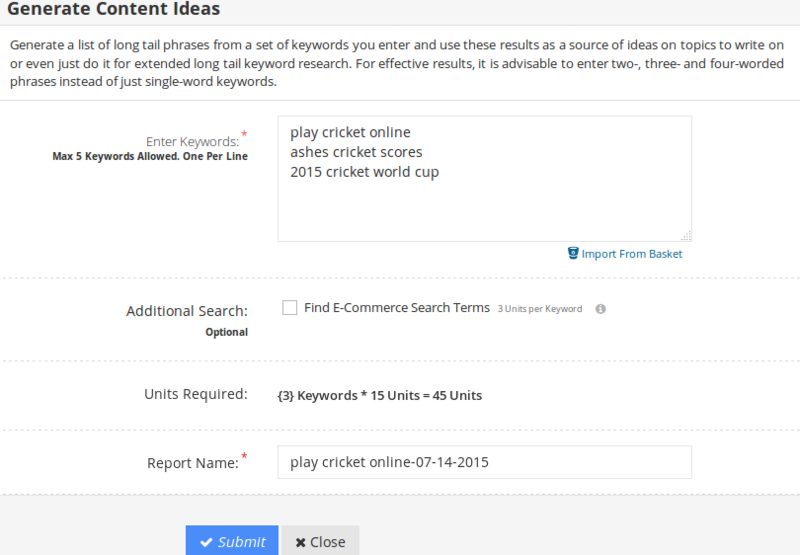 We have entered ‘cricket score’ in the field and will try finding out the search volume for this particular keyword. The target location that we have selected is the United Stats. 0.25 units/keyword have been charged for this operation. 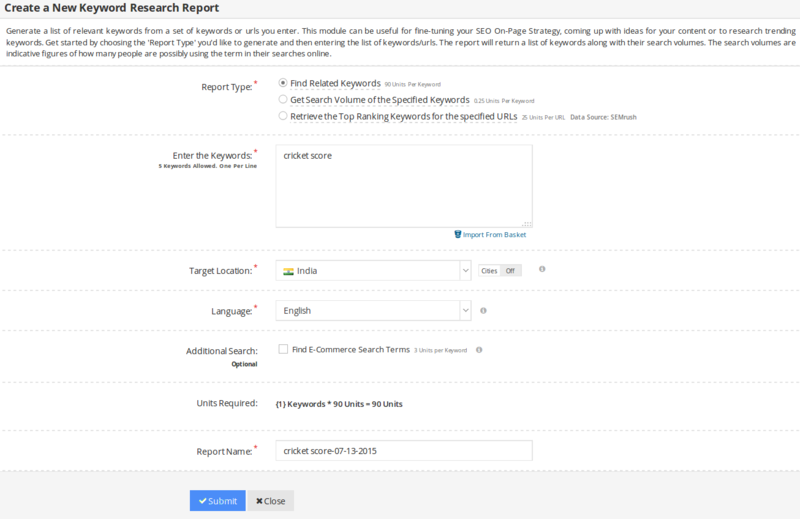 Clicking on ‘View Report‘ will open your Keyword Research report. You will see various sections in the report which we have already discussed in step 4. From the above report, we can come to know the keyword ‘cricket score’ has a Google monthly search volume of 33,100 with competition being 0.01, cost per click 0.08 and 0 impression share. As seen in the above screenshot, we can come to know the top ranking terms for which the URL is ranking. The first column shows a list of long-tail keywords generated from the terms you entered while filling up the form. The second column shows the number of words in the keyword. The third column shows the search volume of the keyword. The forth, fifth and sixth columns show competition, cost per click and impression share respectively. All these terms have been explained in detail earlier in the tutorial. These long-tail keywords can be used to form ideas for content or you can select all/some of the keywords and add them to the keyword basket for future usage. 1) You can find relevant keywords to focus on and fine-tune your SEO on-page optimization strategy. 2) Know the keywords for which you/your competitors’ are ranking in top 20 in Google that you might not be aware of. 3) Generate new content ideas for blogs, articles, guest posts etc by using the Content Ideas tool. (long-tail keywords). 4) Find keywords that are specific to your location as well as specific to cities. Eg – New York – USA, London – UK, India, Australia, Canada etc. 5) Find keywords specific to the target language. Eg- Spanish, English, Latin etc. 6) You can find shopping terms typically used with the keywords entered. Eg – iphone 6, lenovo laptops etc. So, what are you waiting for? Login to your Mondovo account now and start using the Keyword Research tool to outsmart your competition and re-write your content strategy.